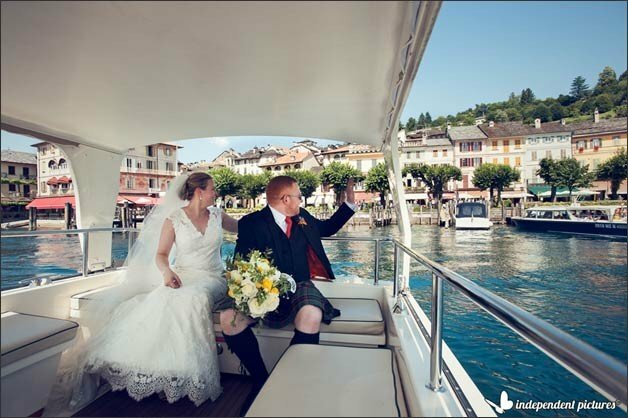 ome of our readers, the ones who follow us, may already seen some wonderful shots of Claire and Kevin’ Scottish wedding on Lake Orta. 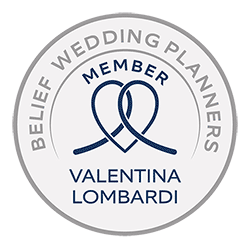 You may have seen them on our July 2015 Just Married post or on our recent post on Belief IWP Awards. 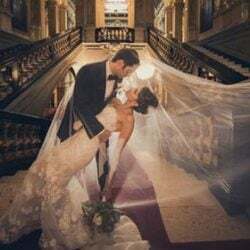 As the matter of fact three wedding photos of Claire and Kevin’s wedding taken by Independent Pictures won Belief International Wedding Planners Award for best Wedding Concept! 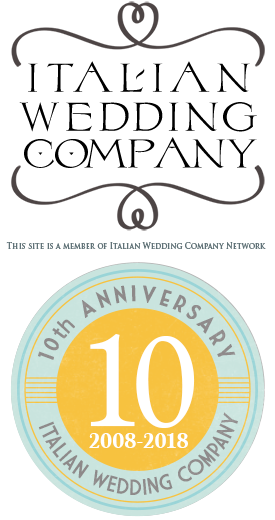 We are very proud about it! 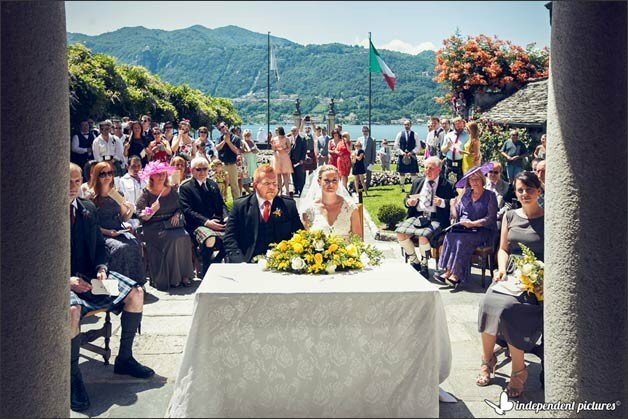 Claire and Kevin got married last July on Lake Orta on a fantastic sunny day! 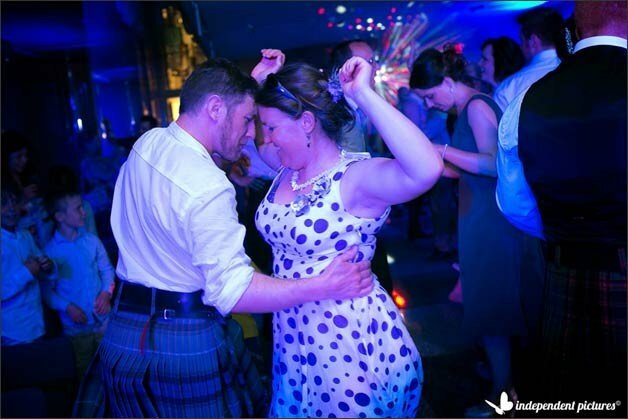 Claire and Kevin planned a travel themed wedding with a Scottish twist. 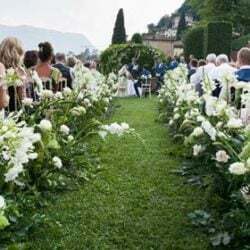 They invited a lot of guests who were happy and pleased to join such a wonderful day. 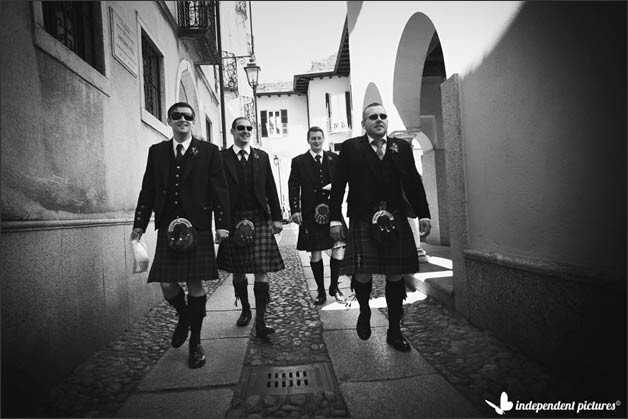 We can be sure that this was one of the biggest Scottish wedding we planned on Lake Orta. 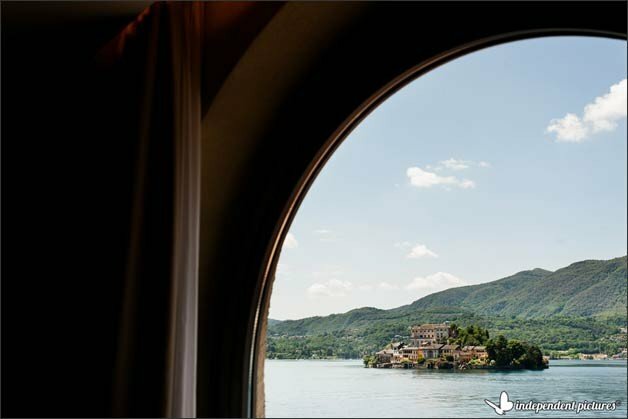 Claire decided to get ready at Hotel San Rocco in one of is lovely suites overlooking the stunning view over Lake Orta and its precious St. Julius Island. 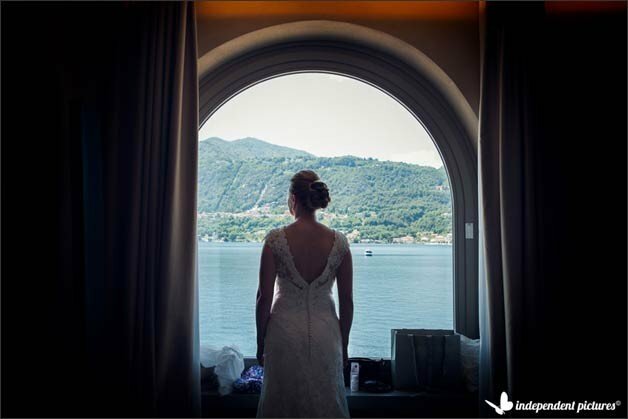 Claire chose a laces wedding dress… a wonderful choice for an Italian wedding. In another room of the same hotel Kevin got ready too with his guys. 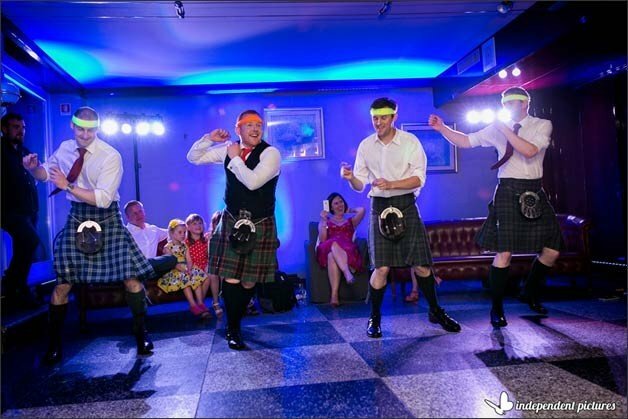 All Scottish men at the wedding wore their traditional kilts. 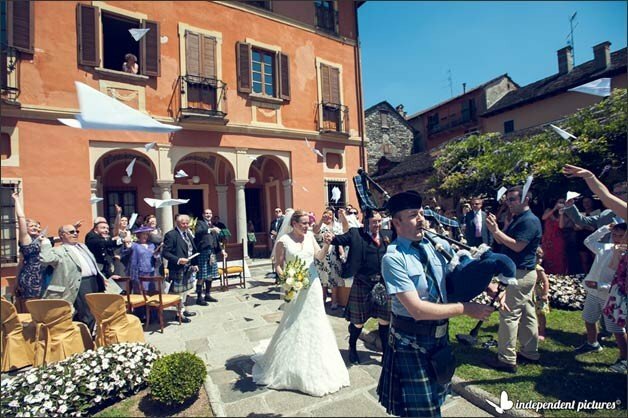 A fantastic touch for a Scottish wedding in Italy. 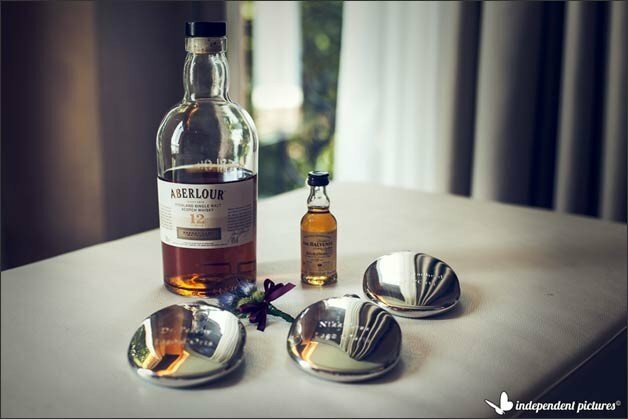 While getting ready men sipped their Scottish whiskey… this could not miss at all! 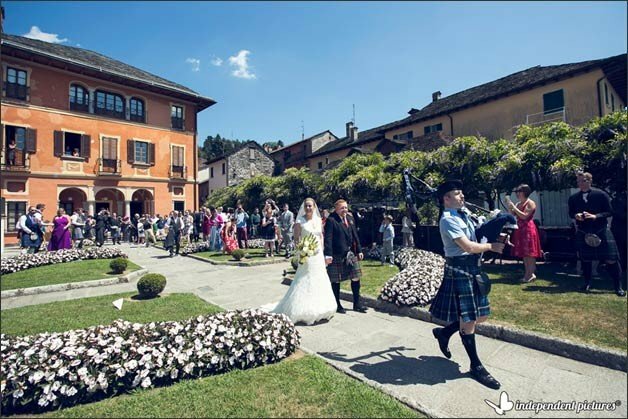 Ceremony was planned to Villa Bossi town hall and at the right time Kevin and his men reached it by foot. 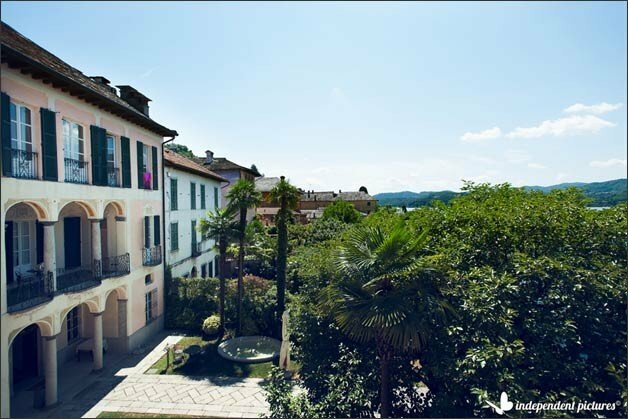 Villa Bossi is literally next door Hotel San Rocco. In the meanwhile Claire got on her rowing boat with her dad. 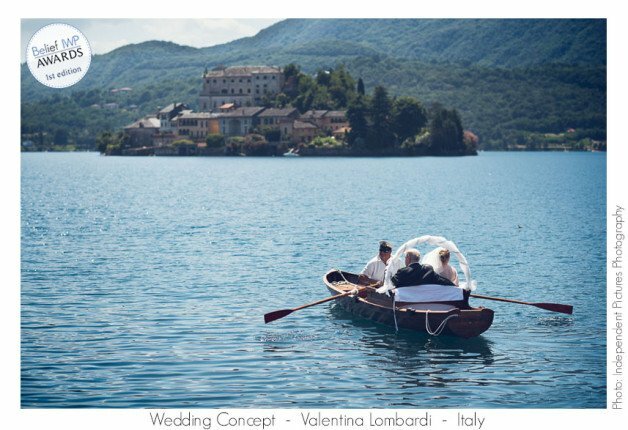 As tradition wants she reached the ceremony venue by water. 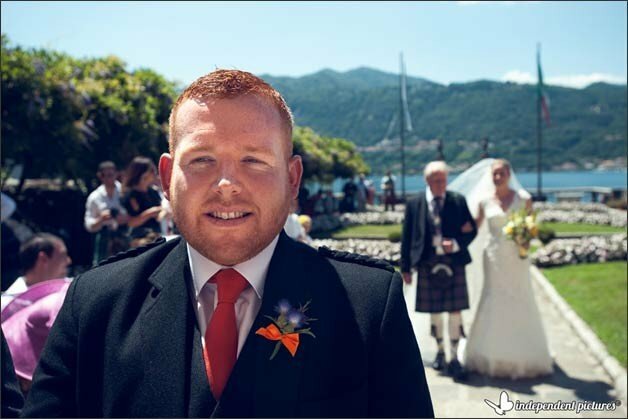 Ceremony was moving and joyful and most of all… colourful! 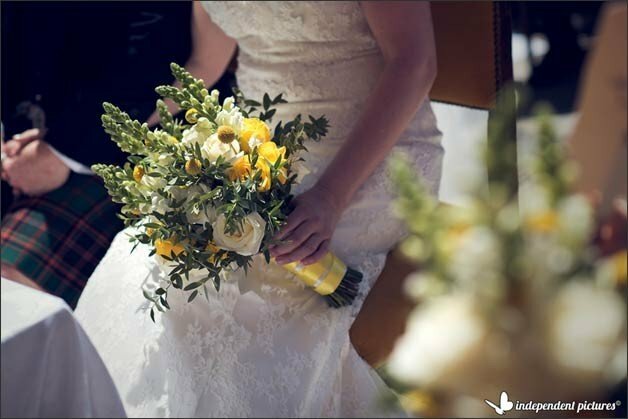 Claire wanted yellow and white roses for her bouquet enriched by loose greenery and country flowers. 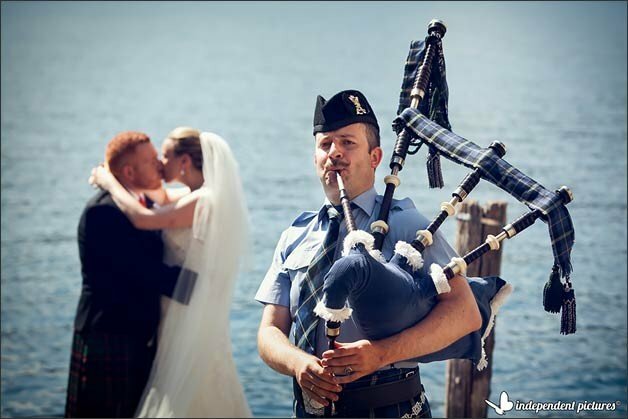 At the end of the ceremony Nick a bagpiper made his appearance and played for bride and groom and their guests a fantastic recessional! 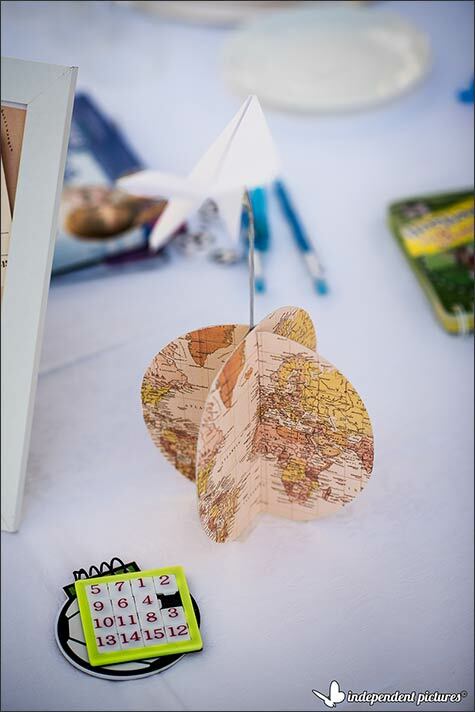 Instead of traditional rice or petals, guests throw a fun paper plane! 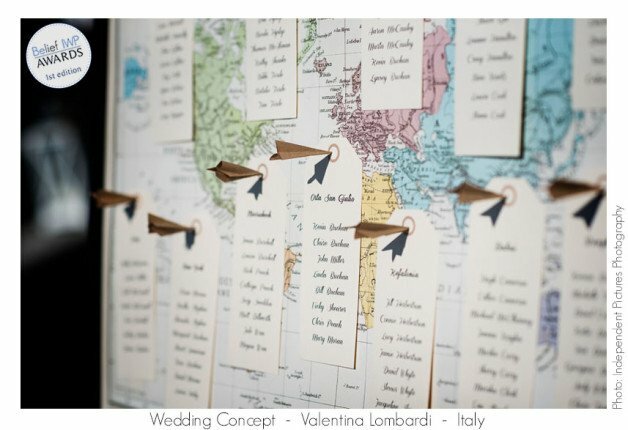 A little touch of Claire and Kevin travel themed wedding! 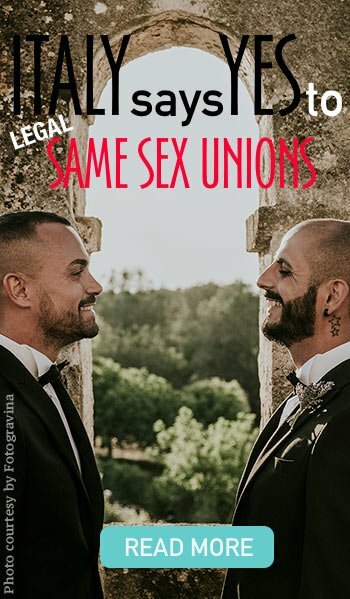 Isn’t if fun? After the ceremony bride and groom took the chance to have some time for their own. They sailed to St. Julius Island with Independent Pictures photographers to take some stunning photos. 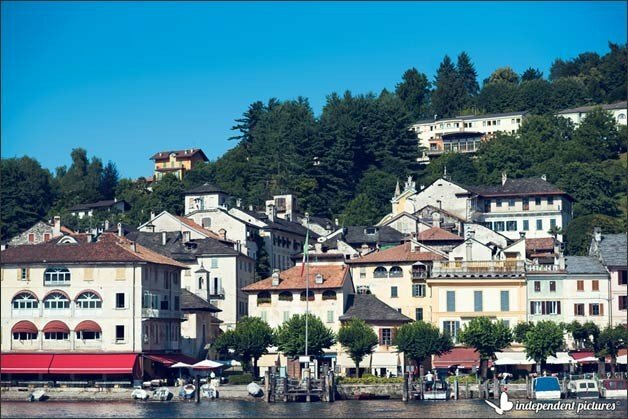 Guest were waiting for them at restaurant Ustaria Ca dal Rat for an aperitif. Ustaria Ca dal Rat was not the reception venue for Claire and Kevin but just their aperitif venue for the after ceremony. 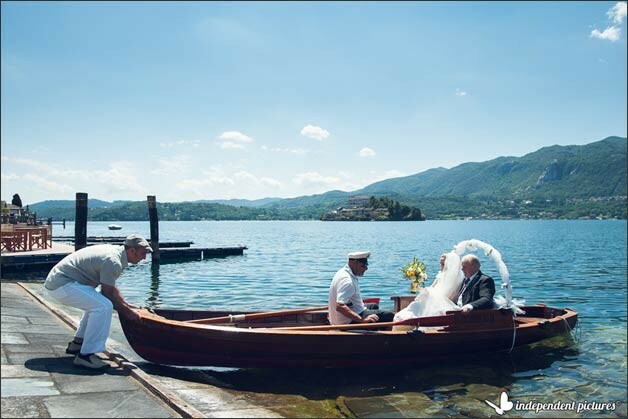 A great idea to make the wedding day a little more fun and dynamic for their guests. 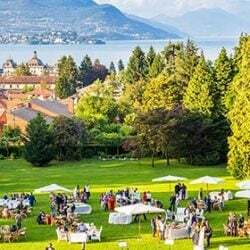 After bride and groom arrived they took some time to mingle and taste wonderful prosecco and finger food by the shores with their family and friends. 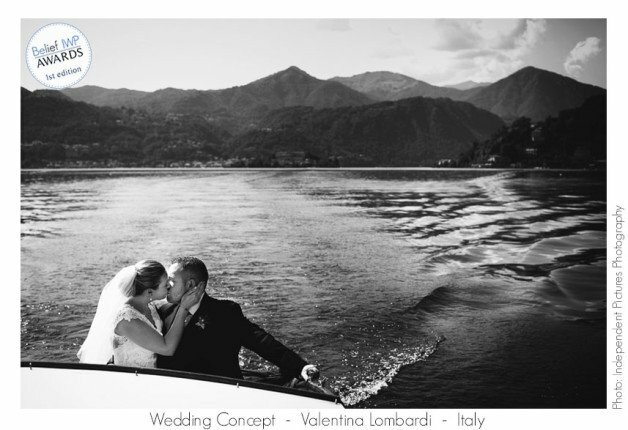 Boat was waiting for them to lead them back to Hotel San Rocco where their wedding reception was planned. 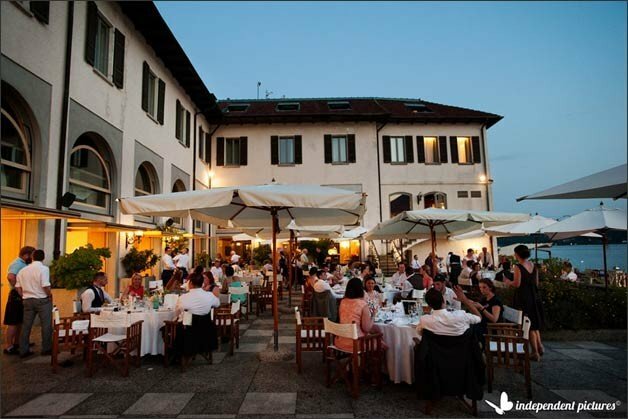 A fantastic outdoor dinner overlooking the sunset on Lake Orta. 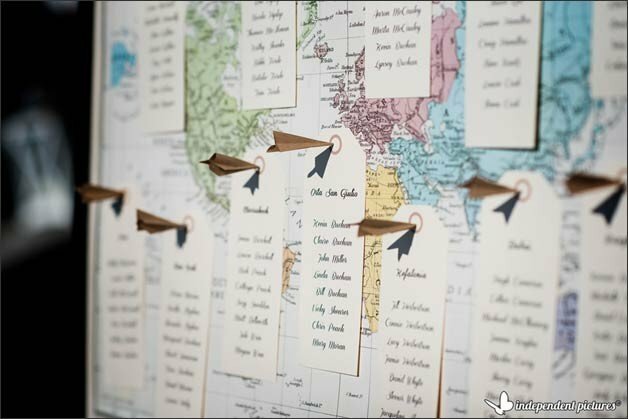 Table names were made of vintage maps of the destination Clare and Kevin visited and table chart was made of a world map with cards for each table pinned with little cute paper plane pins, perfectly matching Clare and Kevin travel themed wedding. 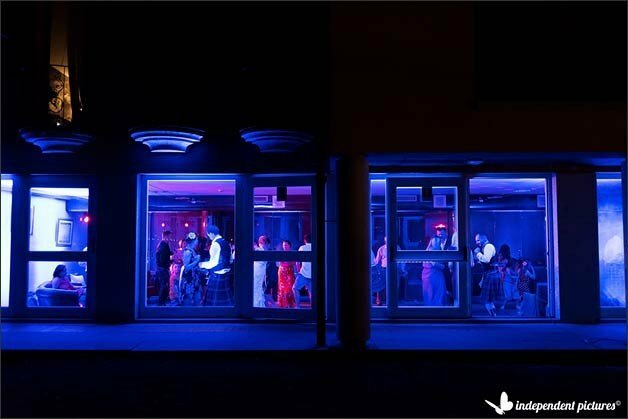 After the reception the whole group moved to Hotel San Rocco dancing area. Kevin and his grooms men surprised all with a groom dance! That was pure fun! 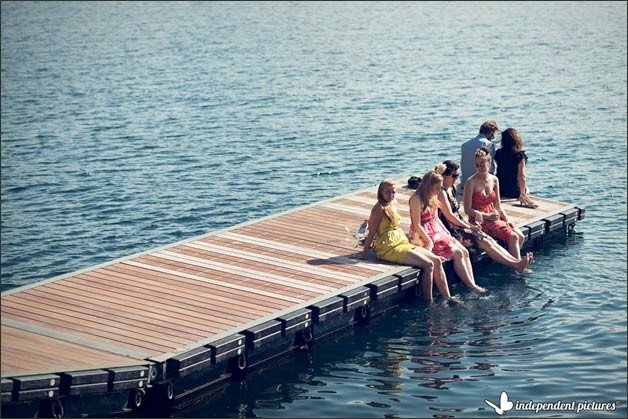 A Dj played for them and the party afterwards was a real success! 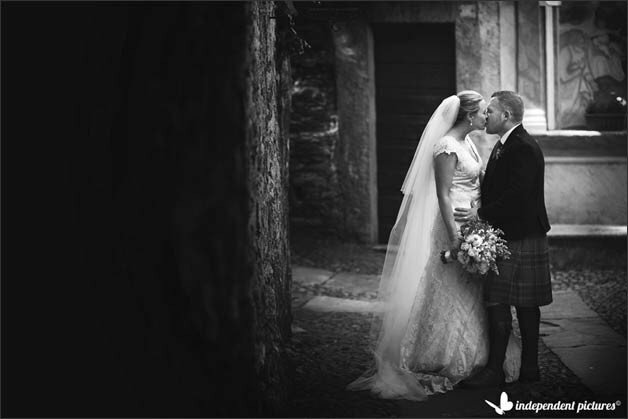 Congratulations Claire and Kevin your wedding was more than special to us!